What are you doing, Knicks? In April, after New York Knicks president Phil Jackson said that aging star Carmelo Anthony “would be better off somewhere else,” it was rising star Kristaps Porzingis who stood in solidarity with Anthony by skipping exit meetings with the team. A few weeks later, Porzingis’ Twitter account sent out a cryptic tweet about the Los Angeles Clippers and the rumor train left the station. He quickly claimed to have been hacked but the wheels were in motion for what was to come. As the trade deadline approached earlier this week, Yahoo’s Adrian Wojnarowski dropped the bombshell that the Knicks were open to trading their star power forward. The reaction was split between “No way that’ll happen” and “LOL Knicks.” Even then, most people seemed to think there was no way New York could be that stupid. And yet, Wednesday evening, it turned out that they were indeed stupid like a fox. Just in case you needed reminding, that’s a 21-year-old, 7-foot-3 franchise cornerstone who averaged 18.1 points, 7.2 rebounds and 2.0 blocks per game last season, being offered up to the Boston Celtics, Los Angeles Lakers, Philadelphia Sixers, and Phoenix Suns for the chance to draft someone new. 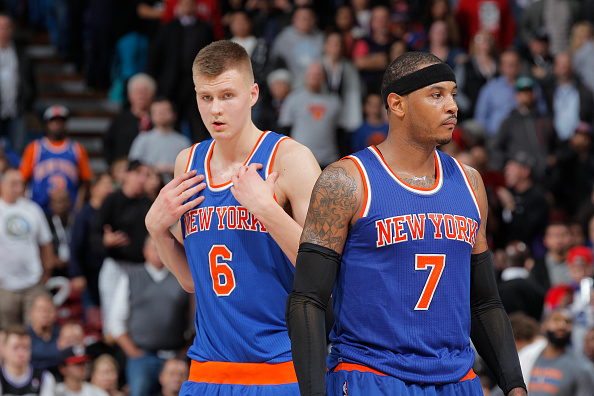 The immediate question is…what are the Knicks thinking? Perhaps the answer is found in those stories from the previous months. Maybe Porzingis is playing some pretty strong hardball with a franchise he doesn’t trust anymore. Maybe he really did tweet his excitement about the possibility of playing the Clippers. Maybe he hasn’t been speaking with the team since the season ended and they’re seeing the writing on the wall. While they’d love to move Carmelo, it’s Kristaps who everyone wants. Would any of those teams make a deal? We know the Sixers are too busy trusting the process, the Lakers are almost certainly all about Lonzo Ball, and the Celtics seem to have a strong idea of what they’re doing. Is it reasonable to think anyone will give up what the Knicks will be asking, even for a stud player like Kristaps? And that then begs the next question…how do Phil Jackson and the Knicks move forward with Porzingis if the trade doesn’t happen now? Phil is officially on record as saying he’s looking to trade his disgruntled star (and reiterated his hope that Melo is gone ASAP) and it’s not like the Knicks are set to contend for a title anytime soon either way. It’s pretty clear that this is going to be very ugly the longer it drags on. Eventually, someone is going to leave town, but will it be Kristaps or Phil? Or both? Knicks fans have gotten used to this kind of madness under James Dolan’s reign but they assumed that Phil Jackson, of all people, wouldn’t let things get this absurd. There’s pretty much nothing this franchise has done in the last decade to back up that claim, so something tells us Knicks fans don’t quite agree with that sentiment.